Concrete damage is not something you’d want but it happens anyway. Indoors, it not only ruins the interior design but can also be a safety hazard. Most homes have wall-to-wall carpets, wood boards, or tile for interior floors. Although these are traditional flooring options, homeowners are still looking for cheaper materials that do not require as much care. This is what decorative concrete does best. Concrete floors are not only restored but also enhanced in both form and function. Stained Concrete – Concrete staining is one of the best ways to color concrete. Acid stains are reactive stains that induce a chemical reaction between its metallic salts and the natural lime and mineral content present in concrete. 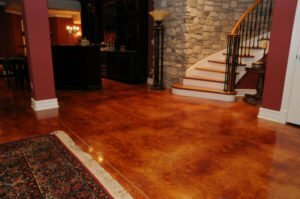 In stained concrete floors, the chemical reactions create random effects and varying color tones that are similar to natural stone and even leather. Water-based stains, on the other hand, are non-reactive so expect solid and uniform colors. Epoxy Flooring – Epoxy is a two-part coating that consists of a resin and hardener. Equal parts of these two are mixed and blended well together before being poured on top of an existing concrete floor. With wide range of colors like pastel, earth tones, or metallic epoxy floors, this is best used on garage and basement floors because of its high resistance to damage. Polyurea Polyaspartic Coating – Similar to epoxy, this two-part material is often used on garage and basement floors. Although it costs a bit more than epoxy, it installs way faster. This fast-drying coating can be installed and cured in just a day. Work with an Expert in Concrete Interior Floors. Call (720) 545-1766 today! There is nothing more upsetting than ugly indoor floors. Denver Concrete Artisans is a leading concrete company that specializes in resurfacing, refinishing, and repairing concrete floors in living rooms, kitchens, bedrooms, and more. When it comes to quality and detail, our team of experts makes sure that nothing short of the best is acquired. Aside from high-quality craftsmanship, we also offer exceptional customer service, making sure that the entire project is fulfilling for the customer and for our team as well. Want a resurfaced floors? Experience what we offer. Call us for a complimentary consultation and a free quotation.